Connecting users securely to the IT resources they need is one of the most important IT requirements for any company. Some may argue that, in fact, user access is the most important activity that IT undertakes. An organization’s digital assets are arguably the most critical resources they have. With technology driving more of our industries and advancements, a security breach or IT compromise can be catastrophic. A number of organizations have experienced significant security issues and have, unfortunately, paid the price. Every major security breach can, more or less, be tied back to user access management, or the lack of it. For example, key credentials that are compromised will result in the ability for hackers to infiltrate a company’s IT network to steal data. The process of managing user access can be complicated in today’s IT environment. What once was an homogenous network located behind the firewall is now a complex, global network in which each individual’s machine is the corporate perimeter. Corporate data is often stored in SaaS (Software-as-a-Service) applications, as well as on cloud infrastructure and employees’ devices. Securing that data starts with one critical component: controlling who has access to systems, servers, the network, devices, and applications. After which, IT can then monitor that access and prevent shadow IT. User access management isn’t a manual process, nor should it be. Companies leverage an identity management platform called the directory service to manage user access and permissions. 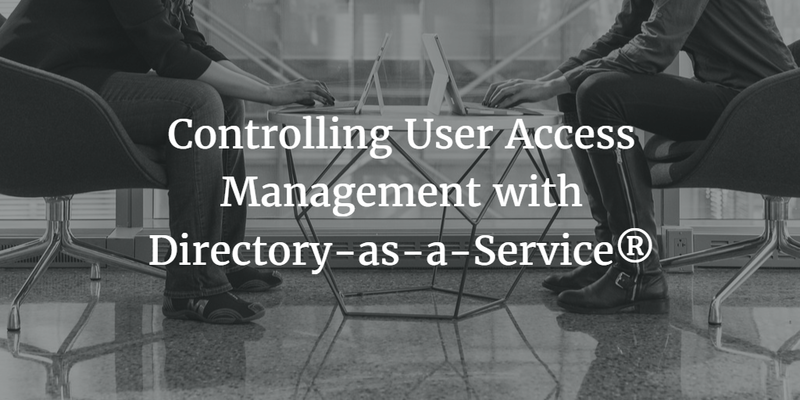 With a directory service, users are entered into the main authoritative directory service and then subsequently connected to the IT resources they need to be able to access. The resources could include systems, applications, networks, or all the above based on the user’s job. Historically, the directory lived on-premise and was either Microsoft Active Directory or OpenLDAP. Both of these solutions have been around for a number of years and have wide adoption. Nowadays, these legacy systems struggle in a cloud-forward environment, because they do not integrate as well, if at all, with cloud-based services. With organizations shifting more resources to the cloud, an on-prem directory constricts IT’s ability to have full control over user access management. To fill the gap, a new multi-platform, multi-protocol solution has emerged: Directory-as-a-Service (DaaS). DaaS is a cloud-hosted directory service delivered as a SaaS-based solution. IT admins enter user information, then connect those users to the IT resources they need to access. The process of controlling user credentials, authenticating access, and logging when access occurred is handled by the cloud directory service. Even the process of installing, configuring, and maintaining the platform is handled by the hosted directory services provider. JumpCloud, as example. What’s more, IT organizations can authenticate users to Windows, Mac, and Linux devices, web or on-premise applications, Google Apps, WiFi networks and more—all with DaaS. In short, Directory-as-a-Service is Microsoft Active Directory and LDAP reimagined for the cloud era. Ready to learn how this Identity-as-a-Service platform can support your user management requirements? Drop us a note. We’d be happy to discuss DaaS and its many benefits with you. Alternatively, sign up for a free account, and see firsthand how DaaS works. Your first 10 users are free forever.